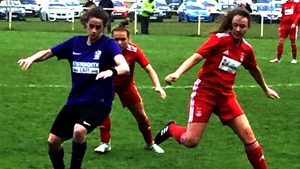 Aberdeen put last week’s cup disappointment behind them with a come-from-behind 4-2 win over Buchan Ladies in Maud. The game almost never took place after the referee failed to turn up for the one thirty kick-off time. A replacement official was tracked down and the game eventually kicked-off over an hour-and-a-half late. Both teams had warmed up prior to the original kick-off time and were left waiting over two-hours from the start of their warm-up until the game finally got underway. The Dons had new signing Francesca Ogilvie on the bench after her arrival earlier in the week and it was the away team that got off to a perfect start. Bayley Hutchison gathered the ball in an advanced position before running right at the heart of the Buchan defence. Hutchison took the ball into the box and around the advancing Buchan keeper Lauren Sangster who pulled the Aberdeen attacker down for a clear penalty. Chloe GOVER stepped up and slotted her left-footed penalty away to give her side the lead with only three minutes on the clock. Gover came close to doubling the lead after nine minutes when her mis-cued cross dropped onto the Buchan crossbar and Natasha Bruce couldn’t keep her header on the rebound down. The home side settled into the game after that scare and they were back on level terms in the fifteenth minute. Anna Blanchard parried a long-range effort against her crossbar and Danica RITCHIE reacted quickest to pounce on the rebound to equalise. Just five minutes later the hosts had turned the game on its head as they went in front. A long ball over the Aberdeen defence found Michelle Sutherland in what seemed like an offside position. As the Dons players appealed SUTHERLAND fired a shot into the top corner of the net to give her side the lead as the ref waved away the Aberdeen appeals. The game was keenly contested as the first-half went on with neither team appearing to be suffering for the pre-match delay. Buchan defender Jennifer Urquhart had a header from a corner comfortably saved by Blanchard before Gover came within inches of equalising at the other end with a shot that just went wide. The final chance of the half fell to the visitors as they just failed to go in level at the break. A fantastic run down the right by Loren Campbell took her all the way into the Buchan penalty area. The right-back then squared to Eilidh Shore who shot wide. The Dons made a change during the interval with Francesca Ogilvie coming on to make her debut in place of Johan Fraser. The away-side started the second half brightly with Chloe Gover first shooting over the bar and then hitting the post with a low shot from the edge of the box. Aberdeen were taking charge of the match by now as they dominated possession but they had to wait until the 72nd minute before they got the reward for their second half improvement. Hutchison’s clipped pass forward to OGILVIE was at an awkward height for the substitute but she collected it well before slotting home a debut goal to make it 2-2. The Dons went search of the winner as first Hutchison and then substitute Lauren Gordon tried their luck from long range. The visitors’ persistence finally paid off in the 81st minute as they deservedly regained the lead. Gover won a corner out on the left wing after being played up the line by Hutchison. Gover herself took the corner and her ball into the box found SHORE in the middle of goal and she headed home from six yards to put the Dons in front. Aberdeen were good value for their lead given their second half performance and they put some gloss on the result with a fourth goal in the 88th minute. Loren Campbell had been a constant threat to the Buchan defence with her powerful runs from the right-back position and she was finally rewarded for her work by grabbing the assist here. Campbell gathered on right, just over half-way, before beating two Buchan defenders and making her way to the by-line at pace. Campbell’s cut-back was thumped into the top corner of the Buchan net with Lauren GORDON appearing to get to the ball just ahead of her marker to complete a 4-2 win. 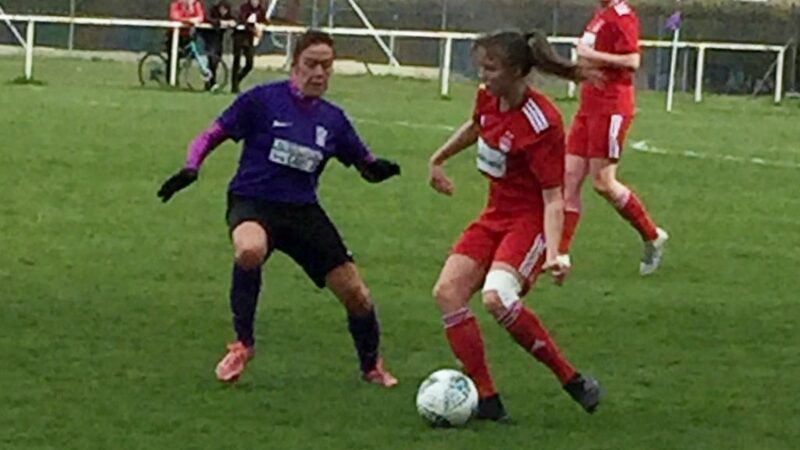 The victory maintains Aberdeen’s perfect record at the top of SWFL1 North and was the perfect response to last week’s cup defeat.